It’s been 15 years since Lara Croft graced the big screen, but now she is back in a new and rebooted adaptation that’s set to escape the ‘video game curse’. Directed by Roar Uthaug, Tomb Raider tells the story of a young Lara Croft, the daughter of an eccentric adventurer who vanished when she was a teenager. Now, at 21, she discovers a clue to his whereabouts and sets out to find him on her first adventure. But she must push herself to her limits in an effort to survive when she finds herself stranded on the same island where he disappeared. 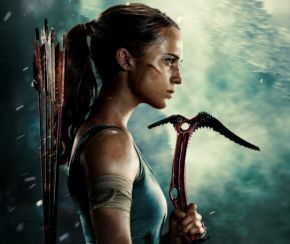 Tomb Raider is the third live action movie to feature the iconic video game heroine, this time played by Swedish BAFTA and Golden Globe nominee Alicia Vikander. Unlike Angelina Jolie before her, Alicia’s interpretation is more grounded and relatable, with Lara starting out as a bike courier in east London before uncovering the clues to her father’s possible location. Alicia Vikander throws herself into the role and gives it her all. She put on 12 lbs of muscle getting into shape and does most of the stunts herself. It really shows in her performance and the film is all the better for it. The film is an adaptation of the 2013 rebooted Tomb Raider game with a similar story of Lara growing from an inexperienced adventurer into a hardened survivor. It tracks her origins and lays the groundwork for her future as the fearless archaeologist. Dominic West stars as Lara’s father Lord Richard Croft, and it’s a welcomed change seeing him not be the villain. He’s a fine choice for the role, but he doesn’t have a lot to do. The villain, Mathias Vogul is played by The Hateful Eight’s Walton Goggins. He truly provides a real menace, but doesn’t have much to him in regards to characterisation, apart from a few lines of dialogue in an effort to flesh him out. The only other character that gets some meaningful screen time is Daniel Wu as sailor Lu Ren, who coincidentally happens to be the son of the man who took Richard Croft to the island. He has some good scenes and plays a key role in helping Lara get to the island, but like Mathias Vogul, he isn’t very fleshed out. Like most adventure stories, the plot involves the characters trying to locate something, in this case, the fabled tomb of the “mother of death” Himiko. It’s a story that lends itself well to the action and creates conflict between the heroes and villains and it works pretty well here. Visually, this is a gorgeous looking movie with some fantastic shots of the island and some brilliantly utilised visual call-backs to the 2013 game, such as the red pickaxe she uses, an almost shot-for-shot recreation of the boat crash, and few tracking shots of her running through the jungles. There is plenty of action to keep the pace going and, for the most part, the action is thrilling and visceral. From the early bike chase to the intense ship wreck, the film has an urgency and quick pace, but it slows down a lot during some of the dialogue heavy scenes. Being an adaptation of a rated 18 game, this does feel watered down at times, but it doesn’t shy away from the more brutal and tense moments that seem reminiscent of the fantastic Uncharted games series, and if the upcoming Uncharted movie is anything like this, we will be in for a treat. Composer Tom Holkenborg, aka Junkie XL, who scored both Batman V Superman: Dawn of Justice and Mad Max: Fury Road, creates the thunderous score for this movie. It helps every scene and never feels out of place. For the most part, the film sticks to just telling the one main story and doesn’t focus on setting up numerous sequels and spin-offs. There are a few big hints at more to come, but whether a sequel actually happens remains to be seen. Overall, this is a good movie with a few problems. A great lead, great action and a good story that keeps you entertained from start to finish, but it doesn’t feel original enough to be unique and takes a lot of ideas from the Indiana Jones trilogy. This is not a bad movie and actually proves to be the best video game adaptation so far. If you are a fan of the new games, it’s hard not to enjoy it. There’s a lot of potential and this could become a good franchise if the story continues. Purple Revolver rating: 3.5/5 – Nearly hits its mark.